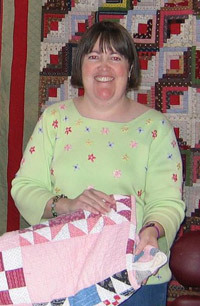 Please join me in welcoming a Guest Blogger to the Quilting Gallery. Find out how you can be a Guest Blogger. Thanks Michele for allowing me to share my love of quilts especially antique quilts and quilt history. If this sounds like a dry topic — think again. Did you know that at one time it was illegal to export the red dye insect and fabric printing methods and illegal to import Indian chintz fabrics? Who knew that Germany had to turn over secret fabric dyeing recipes as part of the resolution of World War I. The history of fabric, dyes and quilting is full of life and death intrigue and what better way to learn than by looking at beautiful quilts? I’ve been quilting for about 11 years and have had a needle in my hand most of my life. As soon as I started quilting it began to take over my life but when I was introduced to quilt history and appraising I became totally obsessed. In 2005 I was fortunate to attend the American Quilter’s Society (AQS) Appraiser training taught by Bobbie Aug and Gerald Roy and I haven’t looked back since. I became an AQS certified quilt appraiser in 2008, one of the first two in Utah (quite an honor as there are only about 90 in the entire United States). What a dream job – people pay me to look at their quilts and share information with them. It is especially gratifying to help people learn more about their family through antique quilts. I’m willing to travel anywhere and everywhere to appraise quilts and share my antique and vintage quilts. I’m an avid quilt collector and present trunk shows/classes on quilt history and fabric dating; it helps justify my collecting addiction. My trunk show, Textile Time Travels, takes you through over 200 hundreds years of history with more than 30 quilts. To learn more about my antique quilts, see my blog. In addition, I make quilts in many styles by both hand and machine. I also reproduce antique quilts from my own collection. I feel a bond with earlier quilters by remaking their quilts. I also teach quilting and have patterns available for several of my quilts and classes. Challenges are a particular stimulus and I’ve had quilts in several traveling exhibits such as the Hoffman Challenge. I’m a competitive quilter and love to enter both local and national shows. A recent highlight was having a quilt shown in Quilter’s Newsletter Magazine. I enjoy working in small scale and one of my favorite subjects is the world famous landscape around my home of Moab, Utah. 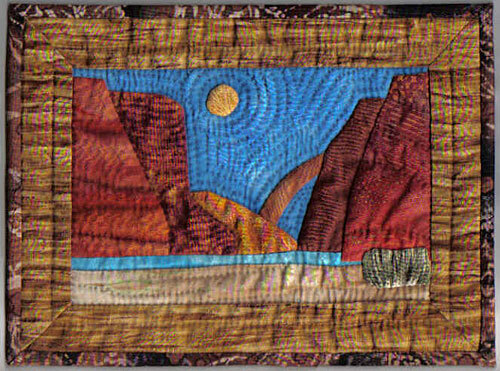 You can see more on my art quilt blog. I’m very lucky to come from a family of quilters. My maternal great grandmother made quilts out of necessity but she did so with style and creative flair. 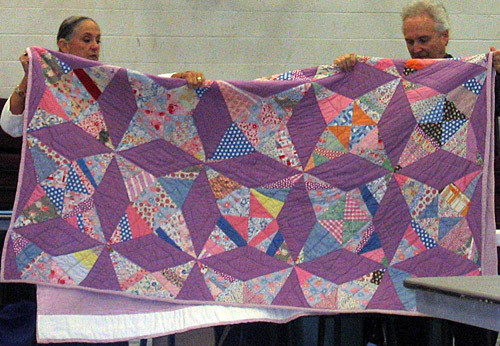 That is her purple Rocky Road to Kansas quilt shown above being held by AQS appraisers Aug and Roy. My mother and sister are both award winning quilters in their own right and very supportive as is my father who often lends us a critical eye when we are designing quilts. 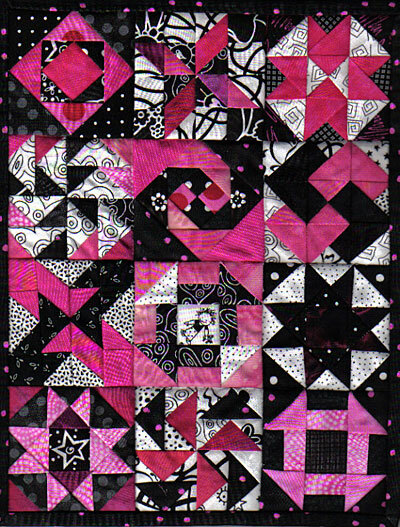 My sister’s award winning Hoffman Challenge quilt is on my art quilt blog. I will select two lucky readers who leave a comment here to receive one of my quilt patterns. Please leave a comment here by March 31, 2009. I never knew that quilt history involved nations! Your job sounds interesting, indeed! What a great job to have! very interesting. I have thoroughly enjoyed reading about your job here. I have to go check out your blog next. Thanks for sharing your love of quilts and knowledge. or go to my art quilt blog and click on PATTERNS in the label list on the right side of the page. I love your quilts, the colors are great. I would love to win one of the patterns. Thanks for the link to your art quilt blog, too … such eye candy! What a great opportunity to get to know you so much better. I have admired your Art Quilts, and now I know I have a kindred spirit who loves and studies Heritage Quilts as much as I do. Thanks for all you do! Sandra, your quilts are beautiful, thank you for sharing your blogs too. Are the quilts on the second photo from your collection as well? Thanks and take care! I enjoyed reading your info . Quilting is indeed addictive. You live in a wonderful part of the world. Thanks for doing the intereview Sandra. It was a treat to find out more about you and your passion. Thanks for sharing. Appraisers are quite diverse, which helps make us good Appraisers. Sharing your knowledge is what is so wonderful in this industry. Your quilts are wonderful and how great it is that you can share the love of quilting with your family. Thanks for sharing and giving us a teasing bit of history. Sandra-I enjoyed reading your article. I am so glad to find someone who can mixed the Traditional quilts with Art Quilts. I moved to Germany in 2008 working for the military. I have not found anyone in the Bavarian Region who quilts and material is often times $25 a meter. Thank goodness I brought plenty of material with me and spend my evenings quilting. I so enjoyed your article and would look forward to making one of your patterns if I win. Great blog Sandra! I love your minis! Thanks so much for posting this site on QHL. I enjoyed your blog and seeing your quilt pictures. I love old quilts and learning about their history. I enjoyed learning a little bit about you and your work. Sandra, I didn’t leave a comment the first time through reading this but I will now. I am wondering, do you have to keep studying (much like professions who do continuing education) for your job as a quilt appraiser? To answer Lisa’s question–YES! We, AQS Certified appraisers are required to keep up to date on values of old and new quilts and historical research as well as trends in current quilting. We are also required to recertify every 3 years with AQS so that they can confirm that we are actively appraising and studying. How long did the embroidered one take? Michele asked if the quilts in the second photo are more of my collection- yes. 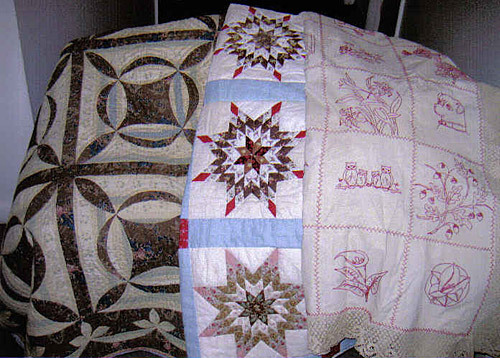 Quilts shown are L-R a circa 1850 applique reel quilt, a c. 1890 blazing star quilt (quilted recently) and a c. 1900 redwork summer spread (an unquilted top that is finished to be used as a cover). And to answer Nova’s question the redwork embroidery is a purchased antique-I didn’t make it. Thanks again. I enjoy reading your blog about antique quilts. I can never see enough quilts. So glad you shared your quilts. I also liked having a face to go with a name. Your quilts are so awesome! Thanks for the chance!! And the winners are #9 Diane Shink and #19 upstatelisa. I will be sending each of them a pattern. Thanks to everyone who commented. You do truly have a dream job!